IF YOU HAVE a few cucumbers and are wondering what to do with them, you might like to try this very good sweet pickle stick recipe. You will need nine fresh cucumber about four inches or shorter. Wash and cut into quarters. Have water boiling hard, then pour over the cucumbers and let stand over night. 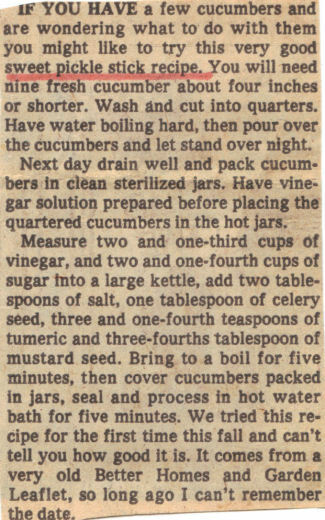 Next day drain well and pack cucumbers in clean sterilized jars. Have vinegar solution prepared before placing the quartered cucumbers in the hot jars. Measure two and one-third cups of vinegar, and two and one-fourth cups of sugar into a large kettle, add two tablespoons of salt, one tablespoon of celery seed, three and one-fourth teaspoons of tumeric and three-fourths tablespoon of mustard seed. Bring to a boil for five minutes, then cover cucumbers packed in jars, seal and process in hot water bath for five minutes. We tried this recipe for the first time this fall and can’t tell you how good it is. It comes from a very old Better Homes and Garden Leaflet, so long ago I can’t remember the date.